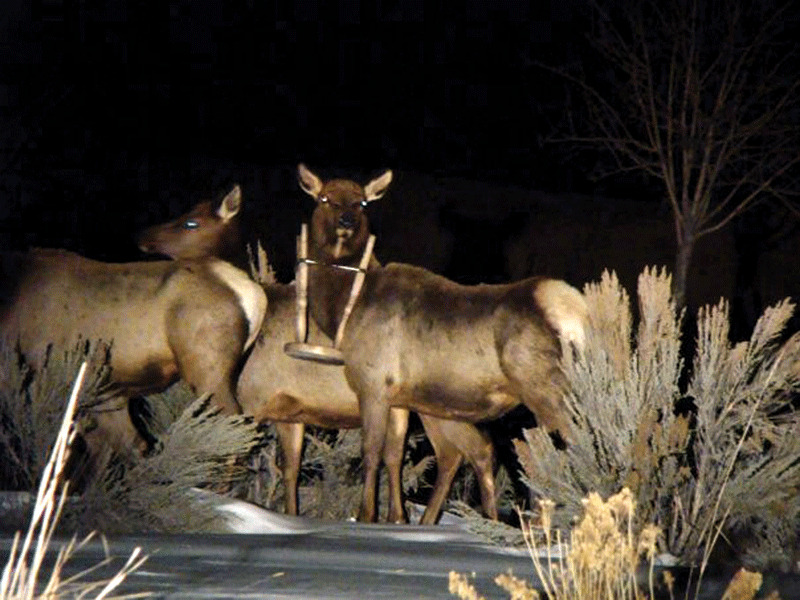 Elk: Special to the Daily/Carrie RousseauBelow, we have foxes in Breckenridge either mating and/or passing gas on each other. Next up is naughty Breckenridge feline Socks enjoying the fox show. And above is an elk in Eagle County that somehow got a bar stool stuck on its head (try explaining that one to the wife). What is this, spring fever among high country animals?! Good morning and welcome to Summit Up, the world’s only daily column that feels like it’s in a fat suit stuffed in a small coat closet surrounded by bowling balls and boring board games and outgrown neon parkas. What we’re trying to say is we’re tight on space these days, and until the ‘conomy kicks back into high gear and we start getting bigger papers, we feel like the space we have for our column is along the lines of aforementioned closet. Ah, we remember the days when we used to ramble for eight hundred or a thousand words, losing most readers just after the salutation as they perused the horizon of verbiage and decided that things like sorting the cough medicines or cleaning the lint out of the old Marine Band harmonica with a Q-Tip would be a better use of time. At first blush, a self-inflicted Angel Alert would seem quite ego centric. You know ” another big ego in Summit County, how unusual. However, doggies and kitties like me; I recycle, and darn it I’m a good person. So there. But maybe we could just ‘roll the tape’. Last Saturday, we went down the hill to Vender to provide some economic stimulus to those fine folks. I yes-sirred and yes-ma’amed, pleased and thank you’d, said “you’re welcome,” “have a nice day” and “you as well.” I carried on brief conversations, yielded to people in crosswalks (even though some folks are obviously in my country illegally) didn’t cut lines, or make rude demands and I tipped appropriately. I didn’t park in fire lanes even though I was “just running in.” Didn’t use the handicapped tag unless my wife-with-the-busted-flipper was getting out. All this when it should be obvious to all that I am a college graduate, a homeowner and a licensed professional responsible for a commercial vehicle. Truly and clearly I am a major dude and therefore immune from displays of courtesy. It should be obvious to all that if it weren’t for the economic contribution of Distinguished Visitors like me, Vender would be little more than Pueblo with indoor plumbing. Of course rudeness was encountered, situations occurred. Inquiries were made, allowances were allowed, other cheeks were turned (all the better to pass gas in their general direction). I didn’t think to punch a bouncer, tell shopkeepers how to entice patrons, or clog aisles even though our $188 surely separated Costco from financial oblivion. Apparently it’s not customary to haul one’s picnic trash at the movie theater but we did; to the point of bringing back recyclables. Also, I forgot to shoplift. I must admit though there were times when it would have been fun to have a Taser or a blow gun. Verily, I say ” I deserve this award. Ah, but wait. Upon further review I’d have to say I can’t take credit alone. It could be said that such behavior is indicative of low self-esteem and a lack of confidence, but maybe not. All in all it was pretty much business as usual, but courteous behavior felt different down there. In the 11 years I’ve been here I’ve learned to behave in a different way. I’ve been taught by example by many of the intelligent, under-appreciated, underemployed yet quietly self-confident dudes and dudettes of Summit County. You know who you are. Humanity, soul, random acts of doin’ the right thing. Your behavior and example are as attractive as the scenery. Mahalo nui for your aloha. As G.W. Bush recently said “It’s good to be home”. OK, moving on, just the other day we had a photo of two foxes doing the mystery dance, and we asked readers to weigh in on what was going on. (We thought it was some kind of mating ritual.) We ran into Friscoite Gil Smith, Rotarian extraordinaire, at a screening of Slumdog Millionaire Tuesday night at Skyline Cinema in Dilverthorne, (only $6.25 for movies on Tuesday!) and he told us something rather interesting. “They’re farting at each other,” said Gil, adding that it was some kind of mating ritual, presumably between two males. (In which case, we observed, lady foxes are very different from human females if they’re impressed by guys doing such.) Gil then went on to attribute the theory to his deceased brother, just in case it is debunked or ridiculed. So there’s that. Plus … we got another photo of foxes doing the mystery dance from Lisa Stone in Breckenridge. Lisa also attached a photo of her cat Socks watching the foxes, which is pretty much cross-species animal voyeurism, if you ask us. Bad Socks! Naughty Socks! For shame! (Editor’s note: The writer of this Summit Up has been sacked in accordance with rules established by People for the Non-Prurient Activities of Domestic Pets and Cute Wildland Creatures). We really have to run.